These outdoor ideas will make you love to be outdoors again. Find the one that fits your outdoor personality and start crafting your dream outdoor space. Find the perfect retreat place out of your house but still within your home with a freestanding outdoor kitchen. A custom built kitchen with the right kitchen range to cook up the most scrumptious meals you and your family can relish together. Create memories-gastronomic in nature with an outdoor kitchen according to your cooking style. You can even choose whether you will have a prefabricated or custom built cooking range and fireplace. Recline in shade and leisure with a pretty pergola overhead. Hang drapes for added privacy and emulate a villa ambiance with sprawling flowering vines all over the trellis. This is what we call the Tuscan effect. In case you can’t get away for the summer, know you have a pocket of Tuscan right in your backyard. For late night conversations and stargazing complete with a little meditation, there’s nothing more helpful than a warm and soft glowing fire to keep you company. Whether it’s wood-fired, gas or even the hypnotic fire glass, get your evening musings going on with a fiery fire pit by your side. Whether you read to relax, do some wine tasting or enjoy entertaining friends, a patio can serve as a great getaway for the weekend without you actually having to leave your home. With some running water nearby, bird-attracting plants and trees or some privacy hedges, find a place of zen with your carefully crafted and constructed traditional patio. 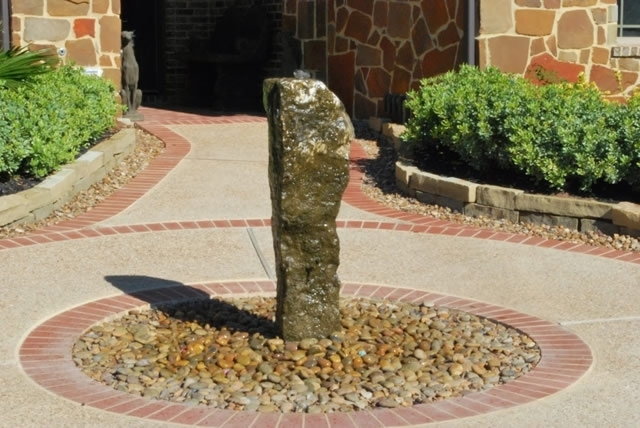 If water is your favorite element, then a recessed fountain might just suit your taste. Creating a fountain out of a single spout, this minimalist take on a fountain achieves a great impact for your outdoors.